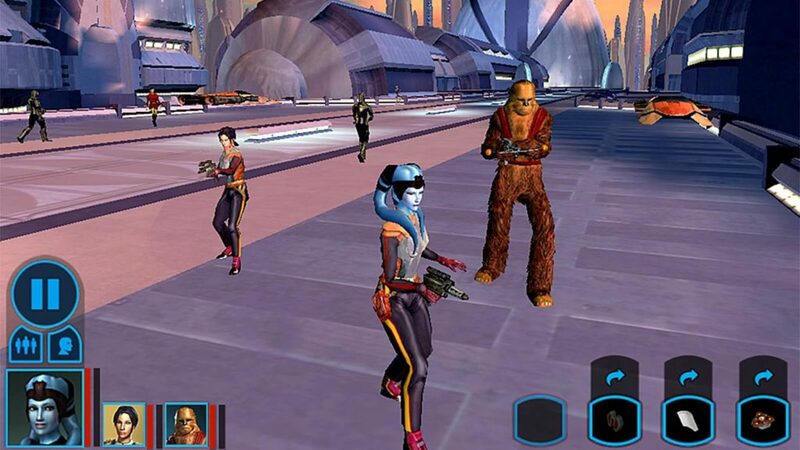 Galaxy of Heroes takes you straight to turn-based tactical battles. There’s no story mode or plot, just battles between the light and dark side. You can choose your side and create your own squad. Data cards and shards are the best ways to collect your favorite heroes and villains. You can upgrade your characters, equip weapon mods, implants and various types of items to make them stronger and unlock special abilities and attacks. Besides single-player missions, there are several other play modes, including a PvP squad arena where you can fight similar-level players. Your squad will battle a randomly chosen player’s squad to rank up and get rewards. If you are bored with PvP, then there’s always the Galactic War, where you keep on fighting enemies until you reach the end of the game board. There are rewards galore, but battles won’t be easy to win. Galaxy of Heroes’ visuals are pretty good. The attention to detail given to character models and environment is amazing. The game has an easy learning curve, but things can be pretty hard if you don’t train your characters, equip items to them and choose your squad members wisely. Based on Lucasfilm’s animated television series, Recon Missions lets you join the rebellion and control a ragtag gang of heroes. The game is an action platformer featuring characters from the Rebels universe. These include Ezra, Ahsoka, Kanan, Zeb, Hera and many more. Your favorite heroes will not only wield blasters and lightsabers to defeat stormtroopers, but also drive the imperial AT-MP to vanquish the empire. 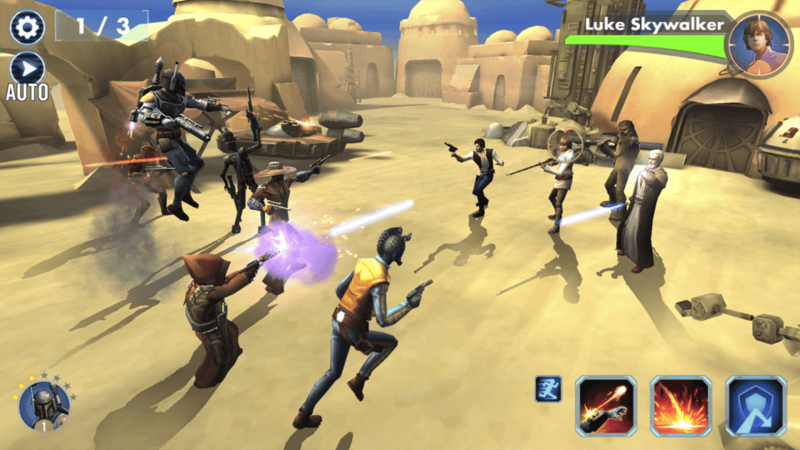 The game has an easy learning curve and simple touch-based controls, making it easy for players to move their characters, jump over obstacles and fight enemies using lightsabers and blasters. Rebels: Recon Missions also lets you manage a secret rebel haven. This secret base can be customized with decorative stuff, towers and buildings. You can also interact with your team and make the most of boosts and bonuses. 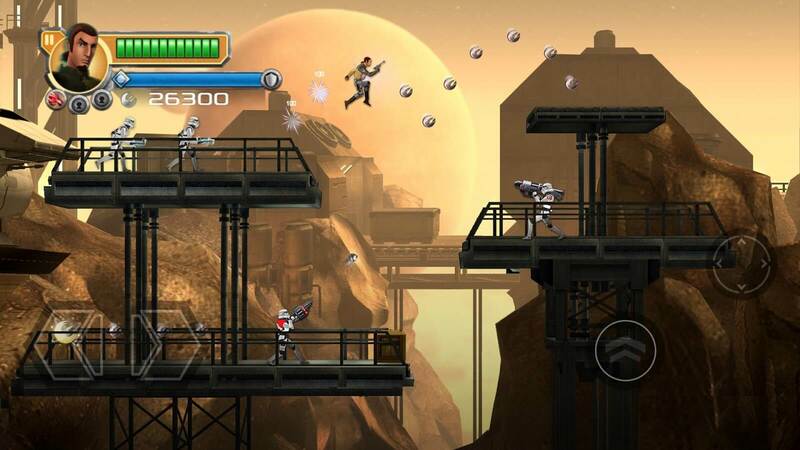 The action platformer is aimed at kids and kids-at-heart. This isn’t just another video game companion app. Inside there’s a fun little strategic card game called Base Command. You can play this game to earn credits, which you can use in Star Wars: Battlefront or just enjoy blasting invading enemies. The game combines card battle with tower defense elements. Your goal is to protect your base from enemies and to do this; you will need to destroy waves of attackers. Just tap on a unit card and if the enemy falls in its range, tap on the enemy. An animated battle will start and your unit will try its best to destroy the enemy. There are different types of unit cards, such as Airspeeders, A-wings, rebel soldiers etc. Boosters make your unit cards stronger. Battles are turn-based, so you may have to wait for the enemy’s turn in case all enemy units are out of your units range or you have used up all cards. And if any card in your hand does not work, then there’s always the handy base cannon to get rid of units that are dangerously close to your base. Base command may seem easy to play, but with different types of enemy units attacking in waves, it really becomes difficult to destroy them. You will need to plan your attack, attach booster cards to unit cards and take out the most threatening enemies first. The game’s quite addicting once you know how to make the most of each unit and booster card. The companion app provides a handy guide, complete with tips and tricks on winning Base Command. Knights of the Old Republic has to be the most amazing role-playing game ever developed. Fans jumped with joy when the Android port was released. And no the game isn’t a stripped-down, mobile version of the original game. It offers a full KOTOR experience, complete with large maps and vehicles, right on your smartphone or tablet screen. You can choose a character from different types of customizable characters, use speeders to quickly travel through large maps, even build a lightsaber. The game’s unique touch screen interface will make it extremely easy for players to play this game on their mobile devices. It also provides support for HID controllers for those who love the good old control system. If you haven’t played this game on your Android device yet, then you are not a Star Wars fans or don’t like role-playing games. Galactic Defense is an excellent tower defense game that lets you place defenses on the battle map and bring your favorite heroes and villains to the battlefield. Battles take place in legendary locations like Tatooine, Hoth, Endor and Kashyyyk. Your goal is to stop waves of enemies by placing ranged, melee, artillery and status towers on the battle map. You can summon up to 3 iconic Star Wars characters in a battle and utilize their special skills and affinities to destroy incoming waves. Support cards will help you beat the final wave and can do immense damage to a large number of enemy units. Identifying key strategic points, placing towers that deal more damage and taking advantage of support cards/champions are crucial to win battles. The game lets you choose your side, be it the Light or Dark side, unlock champions and watch them battle enemies. There are over 60 legendary heroes and villains to unlock. Developers did a great job giving a tower defense twist to world’s most popular space opera franchise. 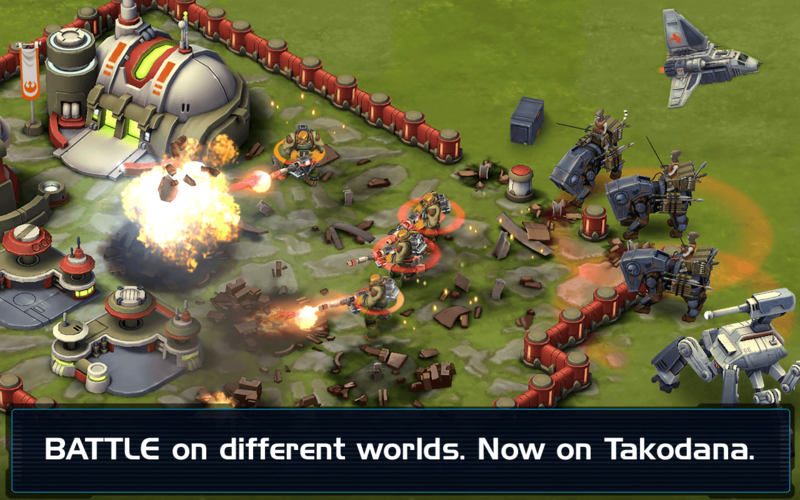 Galactic Defense is an unmissable mobile strategy game and you should download it right away! Force Collection is a casual collectible card game that lets you fight rival players in strategic card battles. The game is known for its unique “Battle formation” mode. 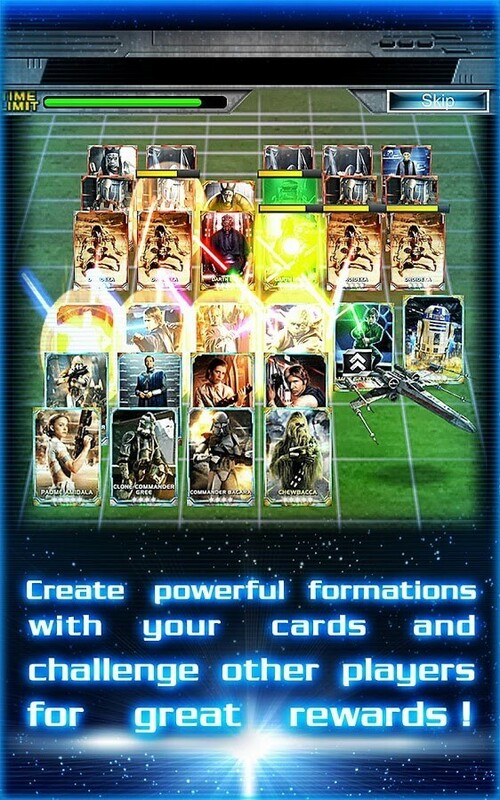 You can create your own card formation by placing character cards, stack cards and vehicle cards on a grid. Your goal is to destroy your opponent’s character cards and protect yours. The outcome of a battle is determined from your card placements and you don’t have any control on your cards when battle starts. Card placement plays a very important role in battle. The game has over 400 cards to collect, including epic hero cards that can be used in battle. Each card has its own unique skills and attack range. Cards can be collected via quests – simple tap-based mini-games – battle bonuses and booster packs. If you have played games like Ayakashi Ghost Guild, then you don’t need any introduction to Force Collection’s quests. Battle formations are engaging, but quests can be a bit dull and repetitive. Collect virtual cards and use them to battle rivals in immersive formation battles. It’s the “birds with lightsabers” versus the Empire’s evil “pigtroopers”. 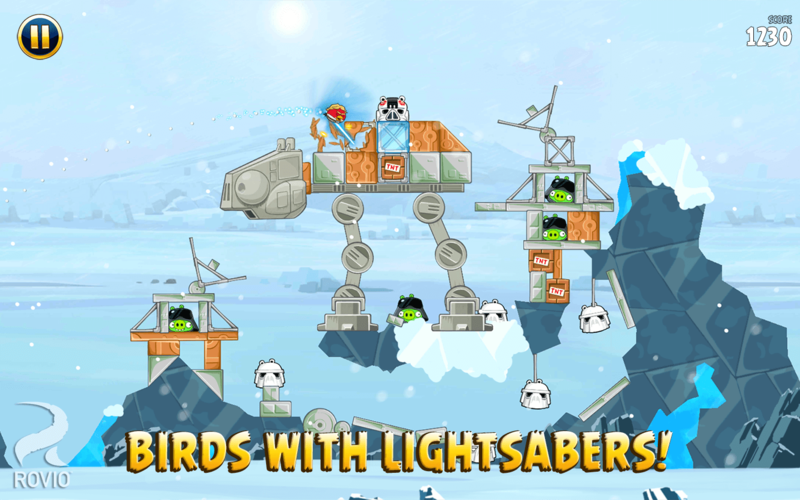 Angry Birds: Star Wars brings the best of both worlds right on your Android smartphones and tablet PCs. The birdie versions of Luke Skywalker, Princess Leia and Chewbacca are downright adorable. Oh and there’s also an evil oink dressed up as Darth Vader. The game adds new features to the popular physics-based game mechanics. Players can use lightsabers and blasters to deal damage to imperial structures made from wood, glass and stones. Each level is more challenging than the other, and offers chockfull of Star Wars references, from walkers to epic locations like the Tatooine and Death Star. There are also secret R2D2 levels and hidden Boba Fett missions waiting to be unlocked. Epic land and space battles await you. May the feathers be with you! 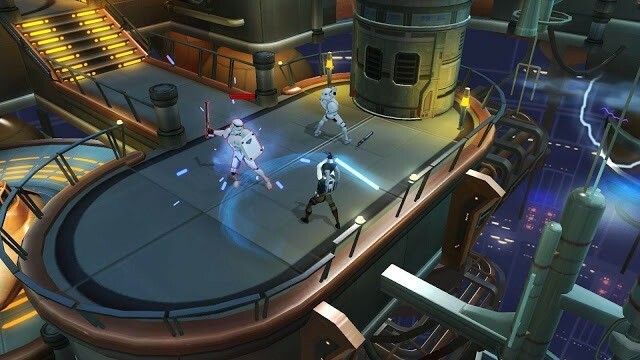 Star Wars: Uprising is a mobile role-playing game with an interesting plot. You step into the shoes of a debt-ridden smuggler who is tasked to do various odd jobs. As you progress, you will join others and rebel against the empire. There are plenty of humorous dialogues exchanged between various characters, which will help you understand the entire plot. Besides a fun storyline, Uprising’s gameplay is quite good for a mobile RPG title. Your character will be teleported to various locations where he will have to complete certain tasks ordered by a faction leader. You can equip lightsaber or blaster to your character, utilize unique gesture-based abilities, equip important gear that improves your character and fight alongside another player in assault missions for loot and rewards. Uprising has a nice story, decent gameplay and some superb game modes like Sector Battles to keep you busy for hours. Commander is a Clash of Clans clone. But that shouldn’t disappoint players, especially those who love Star Wars. 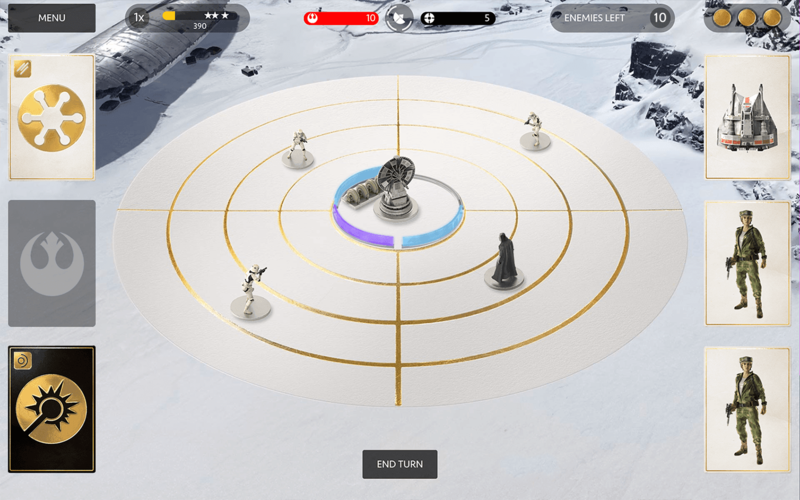 Real-time strategy battles between the Rebel Alliance and the Galactic Empire will make them forget everything, start fortifying their base, build troops and vehicles (they look awesome in action) and summon famous characters from the Star Wars universe to attack rival players’ bases and collect loot. Despite being eerily similar to Clash of Clans, this game won’t bore you, and surely will make you fall in love with the original game, in case you haven’t played or hated it for some reason. The 4th iteration of Star Wars Pinball gets grander! The game offers beautiful tables, including The Force Awakens tables, and plenty of characters to interact with. Tables from the latest Star Wars movie will feature events and characters like Poe, Han Solo, General Leia and Rey. Combined with pinball mechanics, the game brings your favorite characters to life, right on the virtual arcade machine. Each table is a visual treat and contains plenty of references to movies, characters and soundtracks. The artwork is magnificent, so is the 3D design and cleverly placed Star Wars characters like R2D2. It’s a throwback to the good old arcade machines. If you love Star Wars and Pinball, then you should get this from the Play store. 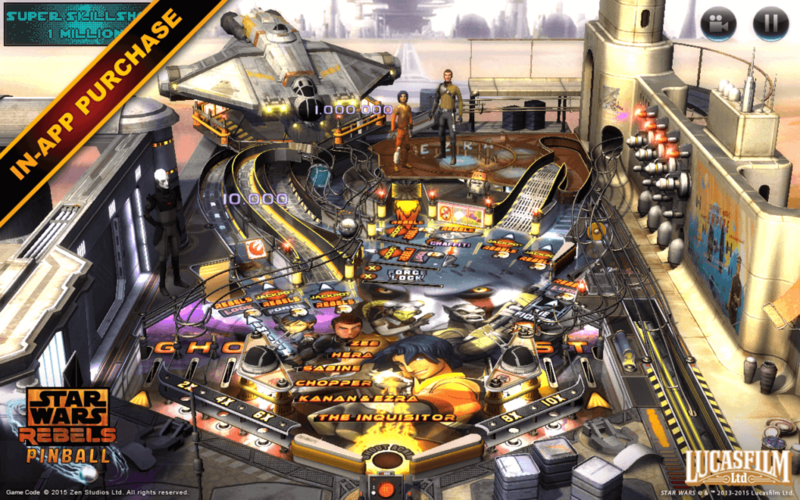 Star Wars: Pinball 4 offers in-app purchases. You will have to buy additional tables if you want to experience the best of Zen Studios’ Pinball game.